The Renaissance period dates from about the 1400s to the 1600s. The Renaissance first came to Italy in about the 15th century because of the country's position on the Mediterranean. The sea trade between Europe and the Middle East led to the development of new ideas. The Renaissance was a rebirth of ancient traditions, especially in Roman and Greek works. A lot of paintings, sculptures, architecture and decorative arts were produced during this period. Before the Renaissance period was the Medieval period. All citizens were concerned about during that time, was life after death and whether you went to Heaven or not. The art that was created then was of poor quality and was all about Christ and the Church. Florence was controlled by the Medici family, a great and wealthy banker family, who were big patrons of the arts (the word ‘Patron’ comes from the Latin word pater, which meant, ‘father’). Wealthy patrons of art paid artists, poets and sculptors lots of money for their work. The merchants especially liked works that showed feeling. In the Early Renaissance, the artists focused on symmetry and the perfect form. Great artists from this period were: Giotto Di Bondone, Masaccio and Donatello. In 1411, Donatello worked on a statue of St. Mark for the linen weavers' guild, which was placed in a niche on the Orsanmichele church in Florence. The niche itself was not created by Donatello, but most likely by Perfetto di Giovanni and Albizzo di Pietro. Donatello was most likely the first sculptor of the Renaissance. His most famous sculpture was his "David", a life-sized bronze statue of a young teenage boy, wearing only a hat, and holding a sword. It was commissioned in 1430 and completed in 1440. 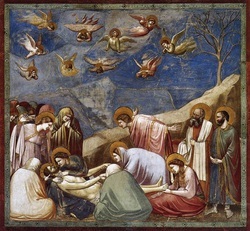 Some people think that Giotto Di Bondone was the first great artist of the Renaissance. He was born in 1267 in or around Florence. In his early years, Bondone was hired as an apprentice for Cimabue. One of the legendary stories about him was that when he was working for Cimabue, he painted a fly on one of his papers that looked so lifelike that Cimabue tried to swipe it off. When Bondone was twenty, he married and had between six and eight children. Bondone was remembered for his wit, personality, and for being so ugly that he seemed to have the appearance of a dwarf. Even though some people think that Giotto Di Bondone and Pisano were the first great Renaissance artists (because they had followers) other people think that the first truly great Renaissance artists did not emerge till 1401 in Florence. All of these artists wanted to sculpt the famous ‘Bronze doors of the Florence Cathedral’. These artists included Brunelleshi, Donetello and Lorenze Ghiberti. The high Renaissance was from 1475 to 1525. This period of the Renaissance was filled with the interests of perspectives and space- with even more realism. Great artists from this time were Michelangelo, Leonardo da Vinci and Raphael. The Sisteen Chapel is a perfect example of High Renaissance artwork. It was painted by Michelangelo, but he did not want to paint it, so, when the Pope went to war, he ran away to sculpt the statues for the Pope's tomb. The Pope's tomb was never finished, because when the Pope returned victorious from his latest war, he was taken back to Rome, and forced to sign the commission to paint the Sisteen Chapel in 1508. He finished the paintings, Including the back wall, The Last Judgement, in 1512. Michelangelo placed the scaffolding in holes, instead of building them up from the ground, because the Pope could not supply him with enough wood. The ceiling frescoes were painted straight onto the plaster, which was a much more difficult than the common techniques at the time. The ceiling frescoes were of the nine scenes from the Book of Genesis. The ceiling frescoes were actually unfinished, as they were presented to the public before they were applied with Lapis Lazuli and Gold Leaf. In the painting on the back wall, The Last Judgement, everyone fears god, even the Virgin Mary, and many of the saints carry their methods of death, such as Saint Bartholomew carrying his skin and the knife he was skinned with, and Saint Lawrence holding the grate he was grilled alive on. Michelangelo also used the last judgement to prevent a cardinal from becoming the Pope. He painted the cardinal, Bagio da Cesena, in hell, as the judge Minos, with donkey ears. Michelangelo is also reputed to have painted himself as the skin of Saint Bartholomew. School of Athens is another great example of High Renaissance artwork. One of its most important aspects is that it is a painting of all of the greatest scholars of Ancient Greece, but it actually showed the greatest artists of the time. Another important aspect of The School of Athens is that Raphael painted Michelangelo with Michelangelo's own style, a huge compliment in the realm of the arts. A portion of School of Athens is shown at the top of this page. Michelangelo is the man in purple, sitting with his legs crossed, leaning on a marble block, thinking. Renaissance architecture replaced Medieval architecture by the sixteenth century. Renaissance architecture included the ‘tunnel vault’, the ‘column and round arch’ and the ‘dome’. All of the buildings used many ancient Roman forms. Lots of Renaissance artists examined ancient Roman ruins to help their work, something which was easy for them to do, given the large number of Roman sites. The architects developed the idea of ‘beauty through proportion’. Filippo Brunelleshi (1377-1446) was one of the most renowned architects of this period. 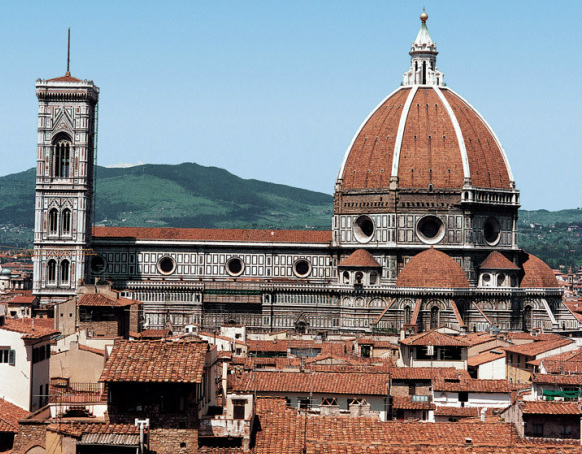 One of his most famous buildings is the Cathedral of Santa Maria del Fiore in Florence.